Laura Halonen joined LALIVE in 2010. She specialises in public international law and international arbitration, with particular emphasis on investment arbitration. 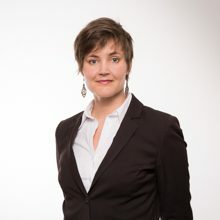 She has acted as counsel, arbitrator and tribunal secretary in numerous international arbitration proceedings (under the rules of ICSID, UNCITRAL, ICC, WIPO, Swiss Chambers, LCIA, SCC and FCC) in relation to investment, privatisation, and other international contracts disputes, in particular in the energy, transport, finance, life sciences and biotechnology and telecommunications sectors. She also advises clients on matters relating to English law and international law, including the law of the sea, human rights law, law of treaties and law on natural resources. Laura Halonen is a member of the advisory board of the European Federation for Investment Law and Arbitration (EFILA). She has been ranked as a Future Leader in Arbitration by Who’s Who Legal since 2017. Prior to joining LALIVE, Laura Halonen was an associate (2005-2008) and trainee (2004-2005) in the international arbitration and public international group of Freshfields Bruckhaus Deringer LLP in Paris, and a trainee in the litigation, corporate and banking groups of the same firm in London (2003-2004). “Perfect lawyer – definitely one for the future”. Laura Halonen is a “perfect lawyer – definitely one for the future”. Laura Halonen is praised for her "excellent presentation and very in-depth knowledge of international arbitration". Helsinki 28/05/2016 Laura Halonen Moderator: Initiatives aimed at naming or shaming arbitrators – could they work? London 25/06/2015 Laura Halonen Speaker: The future of the practice of international arbitration – Who Owns the Process? Hamburg 19/11/2014 Laura Halonen Speaker: Narrower Substantive Standards of Protection? Frankfurt am Main 10/03/2014 Laura Halonen Panellist: The Process of International Arbitration: Are Procedural Practices still divergent or are they converging?